The U2761A is a 20MHz function generator that offers 10 standard waveforms plus pulse and arbitrary waveforms generation capabilities. It uses the common non-proprietary standard high-speed USB 2.0 interface that provides ease of connectivity ─ allowing users to set up and configure their test swiftly with the plug and play feature. It comes bundled with the Agilent Modular Instruments Measurement Manager for quick setup to perform measurement. Users are able to customize waveform by drawing in the arbitrary waveform editor. 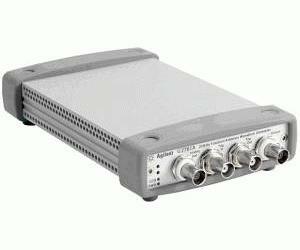 The U2761A can function as a standalone or modular device allowing it to connect with other Agilent USB modular instruments when used with Agilent´s U2700A series modular instrument chassis. Giving users more flexibility, the U2761A is compatible with a wide range of application development environments such as Agilent VEE, NI LabVIEW and Microsoft® Visual Studio®.